The Heavy Vehicle Use Tax, or HVUT, is a fee assessed annually on heavy vehicles operating on public highways at registered gross weights equal to or exceeding 55,000 pounds. The Code of Federal Regulations establishes a framework for HVUT enforcement in 23 CFR 669, and assigns responsibilities to multiple federal and state agencies. 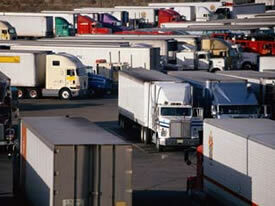 States are required to obtain proof of HVUT payments when registering heavy trucks subject to the tax. The Governor of each state must annually certify compliance with the HVUT requirement prior to January 1 of each year. The Federal Highway Administration (FHWA) has the responsibility to conduct HVUT compliance reviews at least once every three years for each state. Responsibility for conducting these reviews falls to the FHWA Division Offices. In order to improve administration of this program, States and FHWA division offices are encouraged to make greater use of the IRS resources available through IRS District offices. Issues regarding the interpretation of IRS law and regulations pertaining to HVUT go beyond FHWA's certification responsibilities, and need to be answered by the IRS. Copies of completed HVUT reviews should be furnished to the IRS District Office excise tax specialist for information purposes. For more information contact: Michael.Dougherty@dot.gov (FHWA) 202-366-9234.